When you stack up the graphics prowess of the PlayStation 4 against the Xbox One, there’s no doubt that the Sony console is reflected favorably, but as we know, there’s a great deal of difference between the on-paper checklist and real world gaming. 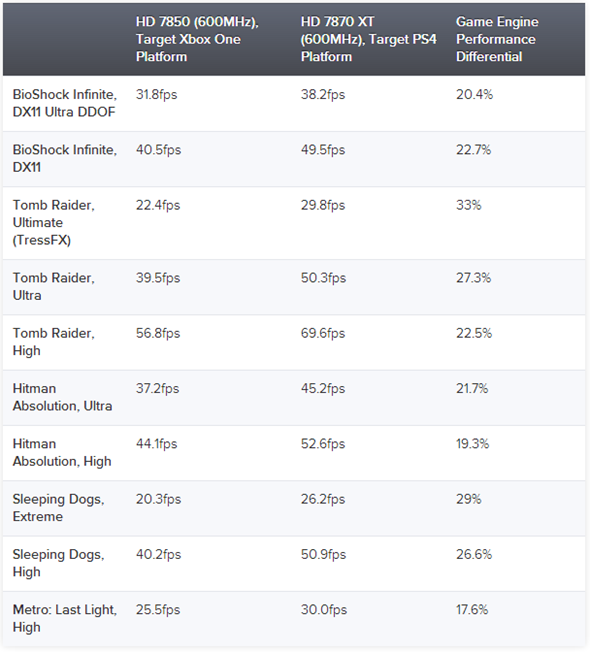 The PlayStation 4, overall, offers around 50 percent more GPU power than its Redmond counterpart, you can’t really draw any firm conclusions from these figures alone. Eurogamer, in collaboration with Digital Foundry, has sought to compare the two unreleased machines by mocking them up using parts similar to those announced, offering a relatively strong idea of what we can expect from each. In order to create a theoretical idea of the graphics prowess of both the Xbox One and PlayStation 4, Eurogamer had to get hold of all the necessary parts. Since a great deal the components weren’t quite apt to the role, some tweaking to the clock speed was needed, but with similar enough components to gauge a rough idea, Eurogamer was ready to begin comparing the ‘Xbox One’ and ‘PlayStation 4’. Both mockups were put rigorously through their paces, and although the PlayStation 4 boasts that 50% bump on its biggest rival, the console could only muster 25 percent faster frame rates. If the resolution were dropped slightly from 1080p, ‘Xbox One’ and ‘PS4’ perform almost identically, which would suggest that when the next-gen consoles do arrive for real, there’s going to be very little to call between them. To be fair, the minds of many a gamer will have already been made up, with console fans famously partisan when it comes to upgrading their hardware. With all the initial controversies out of the way, it’s nice to be able to focus on graphics and general performance rather than whether we’re going to need an always-on connection, or whether in fact used games policies would be crippling the party. Having seen just yesterday how smoothly GTA 5 is looking for the current-gen consoles, we’re certainly not as bothered about next-gen graphics as we used to be. The take-home here seems to be that both the Xbox One and PS4 are almost identical in terms of what they can offer for pure gamers, and at any rate, the war will probably be won in other departments, like motion sensors, set-top box appeal and interface.